With the right care your granite countertops can look just as good decades down the road as they did the day they were installed. The longevity of granite is one of the many reasons it is such a popular material for kitchen remodels. 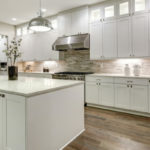 Here are 9 top tips to protect your granite countertops and keep them looking like new for many years to come. Make sure your granite countertops are properly sealed with a high quality granite sealer. Sealants are not only used to give countertops additional shine but to protect them against different types of damages. 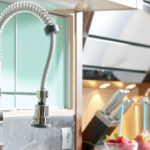 Your countertops should be resealed every so often as needed. The moment you spill something on your countertops make sure to clean it up. The longer substances have a chance to sit on the counters the more likely they are to stain. Sealant will help resist some stains, but granite will naturally absorb some stains if given the opportunity. Many shades of granite are very good at concealing stains, and as a result it’s not uncommon for people to ignore spills or not even notice them until it’s too late. To avoid this, wipe down your countertops daily. You can clean your countertops regularly with good old soap and water. 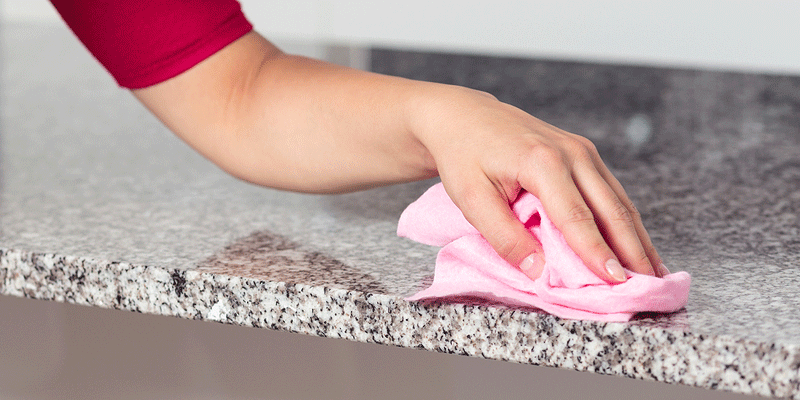 Using harsh chemical cleaners on a regular basis will strip your countertops of sealant faster. Thus creating the opportunity for damage to set in easier, as the porous makeup of the granite becomes exposed. Just beware that overusing soap will lead to a build up, even if you are good about rinsing the soap off. When using soap and water or special granite cleaner make sure to apply with a soft sponge or cloth. It’s also important to be careful what materials touch your countertops during food prep. Highly acidic substances can peel away at the top sealant layer and damage countertops overtime. If acidic materials come into contact with your countertops, at least make sure to clean them off thoroughly immediately after. If you leave a bottle of olive oil out on the countertops all of the time, a layer of oil is likely to develop at the bottom of the bottle. Overtime this will cause the countertops to discolor. When any sort of liquid has prolonged contact with granite there is always the risk for water to seep beneath the surface and create issues. Keep olive oil and other similar products in a cabinet as opposed to directly on countertop surfaces. Soaps, shampoos and all other bottles containing liquid should be kept up off of granite as well. Granite is tough but don’t mistake it for invincible. You should never cut directly on the countertop surface; instead you should always rely on a cutting board. You may not see the damage immediately after cutting but over time you are creating small cuts and damages in the surface that add up. These tiny abrasions directly impact the sealant, which then allows water and other materials to get beneath the surface and impact the porous granite. Bacteria can also get into these pores, infecting your countertops. If acidic substances or wine spills where these cuts have formed your countertops are more likely to become stained. Not to mention, it’s actually damaging to your knives to cut directly on the counter as opposed to using a cutting board. Setting a sweating cold glass on your granite countertop may seem harmless but it could lead to water damage. Always use coasters under your glasses and bottles to protect granite. Granite is highly resistant to heat but you should still proceed with caution. Always use trivets for hot pots and pans instead of setting them directly on the countertop surface. An extremely hot pan can actually create a burn mark. Also, if there is any dirt trapped between the countertops and the pan this could lead to scratches and other issues. What Happens If Granite Scratches Or Stains? In most cases granite stains and cuts in the surface can be repaired so it’s not usually something to worry over too much. 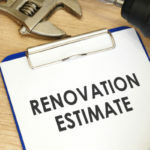 That doesn’t mean repairs will be cheap or even make your countertops look like new again, so being cautious about maintaining countertops is always your best bet. 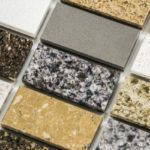 Tops Kitchen Cabinet offers the best prices on high quality granite in many different color options. Visit us today and let our wholesale prices wow you!